All of the pictures on this web site of weddings at Marina Del Rey in the Bronx, New York should tell you that I have a lot of experience working here. Love this place! Exquisite waterfront views of the Whitestone bridge and the New York City NYC skyline beyond makes for a wonderful location for your marriage ceremony and outdoor cocktail hour. Inside the building the main lobby and the ballrooms are some of the most elegant to be found anywhere. This shot of the bride and groom walking along the dock at Marina Del Rey is one of my favorites. The groom is casually strolling along with his cocktail in hand. The couple is looking lovingly into each other’s eyes and Marina Del Rey’s yacht is off in the distant background. 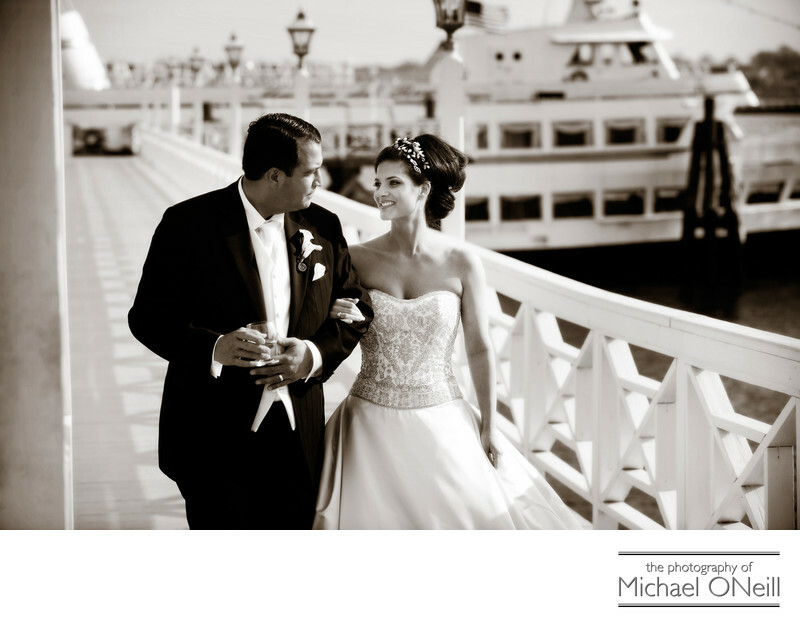 If you are planning a Marina Del Rey wedding give me a call at my Long Island wedding photography studio. I’d love to discuss all of your plans for your special day at this amazing venue.